Creatine is a dietary supplement that many athletes and body builders use to increase high-intensity exercise performance and strength, bulk and body mass. Using creatine may cause any number of side effects, but it varies with each person. Maintaining good hydration may help reduce your risk of getting headaches from using creatine. Creatine is created naturally in the liver and found in fish and meat sources. It's stored in the muscles to help restore and replenish energy levels. The University of Maryland Medical Center explains that creatine can be used to improve athletic performance as well as help people with heart disease, chronic obstructive pulmonary disease, muscular dystrophy and Parkinson's disease. Some people experience headaches as a side effect from using creatine. Muscletalk.co.uk explains that the more creatine that is stored in the muscles, the more water is drawn into and stored in the muscles. Your body's need for water increases, as does your chance of becoming dehydrated. The onset of a headache is a common symptom of dehydration. Maintaining hydration throughout the day can help prevent the development of headaches due to creatine use. 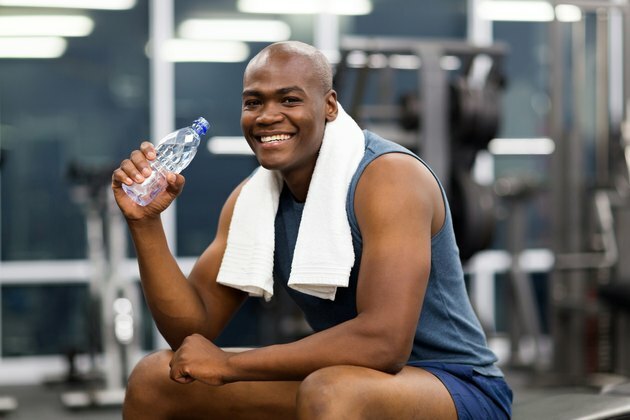 Muscletalk.co.uk explains that it's not possible to place a specific value on daily recommended fluid intake, but a good rule of thumb is to drink water frequently throughout the day. Thirst alone is an inadequate indicator of dehydration. Caffeine is a diuretic that aggravates dehydration, so you should avoid consuming caffeinated products if you take creatine and suffer from headaches. Nucare.com states that taking high doses of creatine can also be a factor in dehydration, so be sure to take only recommended doses. The University of Maryland Medical Center explains that other side effects associated with creatine use may include weight gain, muscle cramps, muscle strains and pulls, upset stomach, diarrhea, dizziness, high blood pressure, liver dysfunction and kidney damage. If you continue to suffer from headaches after reducing creatine intake, increasing your water intake and avoiding caffeine and other diuretics, you may need to stop taking creatine. Consult your physician if headaches worsen.